The new Mac Pro is the most expensive Apple computer we have gotten our hands on, so we haven't been eager to disassemble it. Luckily, someone was up to the sketchy task. 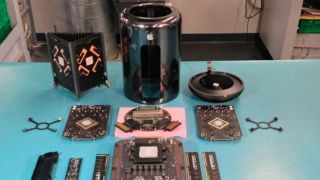 The first known Mac Pro late 2013 teardown reveals that Apple's component-packed "trash can" has a processor that is socketed, according to Other World Computing. This means that the Intel Xeon CPU in the Mac Pro is conveniently removable, opening the door up to future upgrades. "The Intel Xeon E5 processor found in the Mac Pro is indeed removable," noted Other World Computer to Mac Rumors. "All four available CPUs for the new Mac Pro use the same LGA 2011 socket standardized on the Mac Pro's motherboard." The fact that the Mac Pro CPU appears to be upgradeable is great news for professionals who plan to keep this cylinder-shaped desktop computer around for a while. Apple customers can safely order the quad-core entry-level model for the not-so-entry-level price of $2,999 (about £2,499, AU$3,999) without regretting it in the future. That hasn't always been the case with Apple computers. The company has soldered both the CPUs and RAM components of its MacBook Pro Retina and MacBook Air lineup for a slimmer profile. That doesn't appear to be the case according to today's teardown. No word if the disassembly team was able to put Humpty Dumpty back together again.